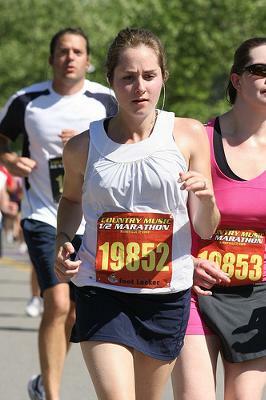 Below I've gathered lots of tips for how to remove perspiration and sweat stains from clothes. Fortunately, there are lots of possible ways to get rid of these stains, since they are so very common. That is because, of course, everyone sweats while exercising and in other similar situations, including when stressed. Of course, for all of these suggestions below, which focus mainly on home remedies, it is easiest if you deal with the stain as soon as possible. The longer you wait the more likely that the fabric will become yellowed, perhaps permanently, from a chemical reaction between the perspiration and the clothing, and also may react with the dyes in the cloth, changing its color. Although I've gathered several methods you can try, I am always looking for more ideas and suggestions. If you've got a method you've successfully used I'd love to hear about it. 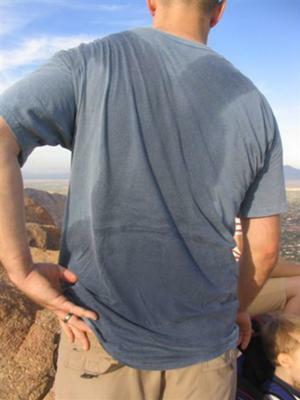 You can share your tips for removing perspiration stains here, so I can add them to the page. Further, the link will also take you to additional recommendations for stain removers that various readers have successfully used for these spots and stains. So, without further ado, scroll down to see the tips I've already collected, that will hopefully help you! Join in and write your own page! It's easy to do. How? Simply click here to return to perspiration stains. The video below shows several techniques for removing perspiration stains from clothing. In fact, it provides six different alternative ways to remove those sweat stains. These alternative methods for removal go from the least to the most aggressive. 1. For fresh perspiration stains try rubbing a mild bar soap (which does not contain dyes, like Ivory) to the stained area. 2. Mix a solution of 4 tablespoons of salt and 1 quart hot water and either blot this solution onto the sweat stain, or for really stubborn stains soak the garment in the salt solution. 3. Create a paste of baking soda and water and rub this onto the stains, and let it sit for 30 minutes and then brush it off. 4. Combine three gallons of water and 1/4 cup of white vinegar and soak clothing in it overnight. Hint: Do not use this method if your garment contains cotton, acetate, silk or linen. 5. Blot a solution of 1 teaspoon ammonia and 2 cups cold water onto the area, and then rinse thoroughly afterward. Hint: Do not use this method if your garment contains wool or silk. 6. Mix 3/4 teaspoon rosemary essential oil and 1/2 cup hydrogen peroxide in a spray bottle, and shake to combine. Then spray the area with this solution and let it sit for 30 minutes. Hint: Test this solution first, in an inconspicuous location, to make sure it does not harm your fabric before spraying it directly onto the stained area. Whichever of these six methods you choose, be sure to wash your garment as normal afterward to get rid of the stain removal solutions. Also, make sure you don't dry the garment in the dryer until you know you have removed the perspiration stain, so you don't set it. I've got even more tips and home remedies below. Below is a video giving advice for how to remove these spots with aspirin. Basically, the idea is to use a crushed up aspirin in a glass of water as a presoak for your washable clothing which has gotten sweat stains. The video instructs you to let the item presoak for approximately 2-3 hours, and then to wash it as usual. There is no explanation in the video for why this would work, but it makes sense in a way. Technically, the scientific name for aspirin is acetylsalicylic acid. I presume this chemical, in the aspirin, helps break down the sweat and perspiration causing the stain. 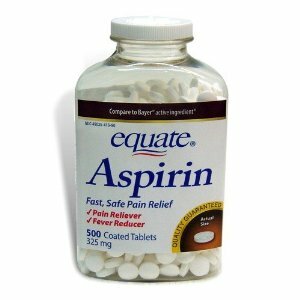 If you want to know about more ways to use aspirin check out this video about aspirin uses throughout your home. I go the health club frequently. 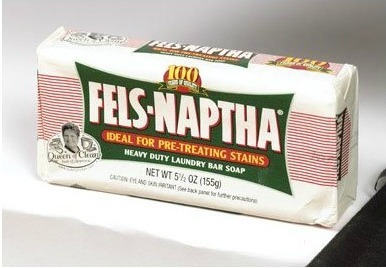 When it comes to laundering my work out clothes I always rub some Fels Naptha on the under arm areas of my tops. It really helps with the sweat stains and it is only about a buck per bar. I have also successfully used it on grass and blood stains. Thanks for sharing this tip Sue. It is always amazing to me how many uses for this simple laundry bar this product has. In fact, I have collected quite a number of uses for Fels Naptha that you can read about at the link! I keep a soak bucket in the laundry room just for presoaking clothes we wear to the gym and for jogging. I just drop them in the bucket and let them soak. It really helps tackle perspiration stains and of course the odors associated with them. This method is really easy because when I accumulate enough for a wash load I simply empty the bucket into the machine and wash. Thanks for this tip Rita. 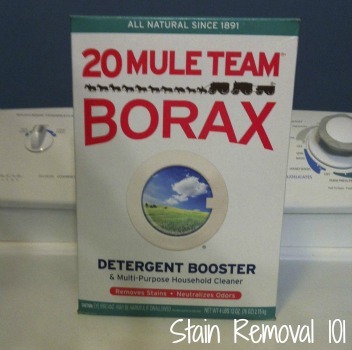 There are just so many uses for Borax powder for all over your home. You can click the link to read even more I've collected, or to share your own! Below is a video giving tips for how to remove sweat stains from clothing. The suggestions provided are quite similar to my advice for perspiration stain removal. The tips included in the video also share how to prevent these stains from forming in the first place. The way to do this is to apply some liquid laundry detergent to the underarm area of your shirts prior to washing, and to wash them in the hottest water that is safe for the fabric at least every third wash. If a stain does develop you can blot the stain with either vinegar or ammonia. You can also pretreat a stain that is caused by both deodorant and sweat with a laundry stain remover or a laundry detergent solution, letting it sit for at least ten minutes, and then washing the item in the hottest water allowed for the fabric. I'd love to hear even more tips from you, that I can add to the page. You can submit your own tip or home remedy here. I'm looking for a way to remove set in sweat stains from my husbands undershirts. Of course, I googled it. One of the recommendations was to rub vinegar directly onto the stains before tossing into the washing machine. I poured vinegar into a dish and put each pit stain into the vinegar and rubbed vigorously. I then tossed the tshirts into the washing machine with the regular detergent and bleach. I washed on normal cycle in hot water. Needless to say, the vinegar rub did NOTHING for the stains. His tshirts looked the same as before they were washed. I know this section is for tips and hints, well, my tip is: Don't waste your time trying vinegar on armpit / sweat stains. IT DOES NOT WORK. 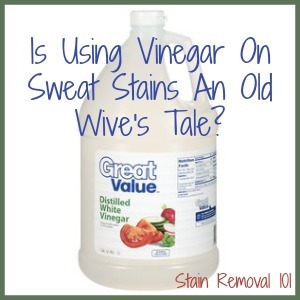 I have, for some time now, recommended using vinegar on these stains (although I suggest soaking in it for at least 30 minutes, which is slightly different than your approach), but I am learning more about stain removal all the time and I appreciate you sharing that this didn't work for you. I think part of it is that everyone's sweat is a bit different, and what will work well for one person just doesn't on another. That is frustrating, but unfortunately true. I have been amazed by how many wonderful suggestions readers have provided me for getting rid of these yucky splotches on clothing though, and some of them are quite simple. Along with the ones shared above, I keep getting suggestions from people that they use Lestoil for really tough stains of this variety. I'd love to hear from even more people sharing whether vinegar worked for them or not. Perhaps I need to reevaluate this suggestion, or at least refine my instructions for how to use it. You can share your tips here or read lots of other suggestions that have also been made by readers (even more than are contained on this page). My husband has the same problem. To the reader who had a problem with her has been having oily stains on the bed linens, mine does too. And it's the same smell in the pillowcases and sheets even when they been washed thoroughly. Sorry I haven't found an answer to it yet, but you're not alone. I have a favorite white blouse with thread flowers across the top of the chest. My question is, will I be able to remove those stains if they are now a greyish color. They are big enough now, you can see them even with my arms down. I sure hope so. My husband sweats while he sleeps and the oils from his body and hair stain the pillow cases and sheets. How can I get rid of the oily feeling and stains? Greasy sweat stains are ruining my life! My husband's sweat is very greasy and leaves greasy marks on all of my bedding. It looks and feels like someone has poured cooking oil all over it. It stains as well, but dark orange like rust rather than the normal bleaching. His clothes turn stiff as board, especially round the arm pits and washing, even with conditioner, doesn't soften them up again. His clothes and bedding always feel damp even when they are completely dry and they never come out smelling clean - not the normal BO smell but an awful greasy smell like chip fat. He has a really good diet, I cook everything from scratch, he never gets anything oily. I've tried everything to get the grease out and the stains but nothing works. I'm forever throwing things out. Do you have any tips for this problem? I've never heard of this happening to anyone else! Please help! Spray Skin So Soft (affiliate) on sweat stains. Removes them with ease. Also I just used it to get oil, dirt and grime out of my husband's work clothes. I am so sorry the lady who tried vinegar for these stains found it did not work. I WILL, however, tell you that over time it does. I began using vinegar as a rinse agent instead of fabric softener. I noticed after several washings my husband`s underarm deodorant/sweat stains were getting lighter. They have now virtually disappeared. I also have found that with new clothing they do not seem to be setting in as they did with the fabric softener. So, perhaps, please just continue to use the vinegar as a rinse agent and perhaps you will have the same luck.